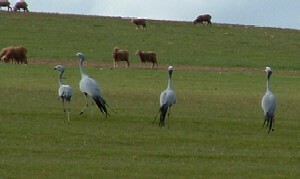 Photo V. Ward Blue Cranes, which are common on the fields of the farms surrounding De Hoop Nature Reserve. Photo H.D. Oschadleus The group visited the lookout point to view the Cape Vulture colony with Kevin Shaw of Western Cape Nature Conservation Board. 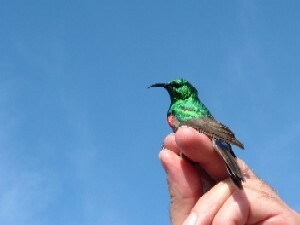 Photo V. Ward This Lesser Double-collared Sunbird was just one of the interesting species encounterd during the course. Photo H.D. 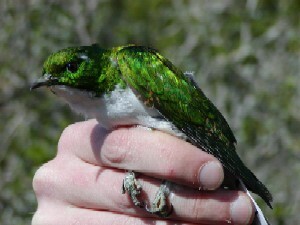 Oschadleus Klaas's Cuckoo (male). Photo H.D. 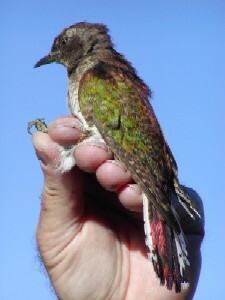 Oschadleus Klaas's Cuckoo (female). Photo H.D. 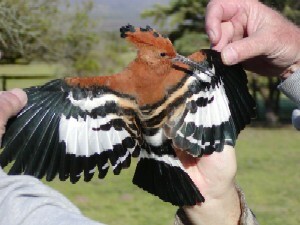 Oschadleus African Hoopoe (male). Photo H.D. 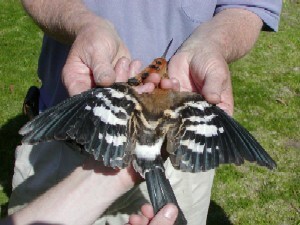 Oschadleus African Hoopoe (female). 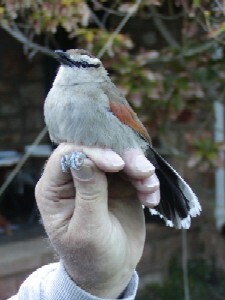 Note the difference in the wing barring between the sexes. Photo H.D. 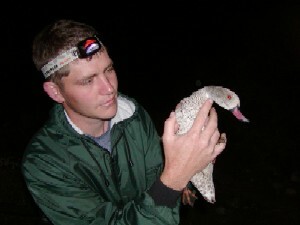 Oschadleus Some memebers of the group went night ringing for waders on the De Hoop vlei. They managed to ring this Cape Teal, held by Marius Wheeler, along with numerous other wader species. Photo H.D. Oschadleus The night ringing was enjoyed by all participants, even the mud! Here Dalton Gibbs of Rondevlei Nature Reserve and Peter D'Arcy of Botswana clear the net of some of the plovers. 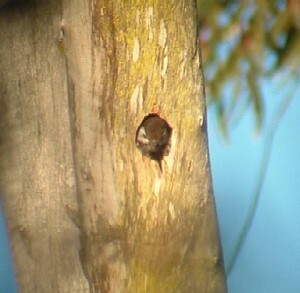 Photo V. Ward Two species of woodpecker were sighted. Cardinal Woodpecker in nest. 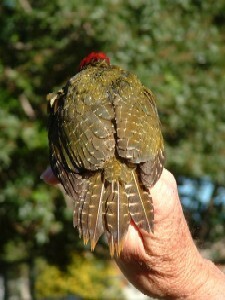 Photo V. Ward We only managed to catch and ring one woodpecker: Knysna Woodpecker. 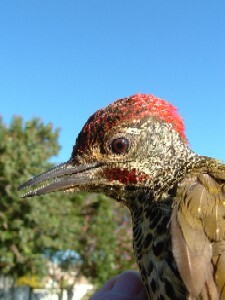 Photo V. Ward Knysna Woodpecker. 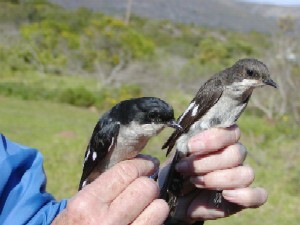 Photo V. Ward Cape Canaries, caught at the small dam near to the Klippies centre on Potberg. Vincent was most happy! Photo H.D. Oschadleus A pair of ringed Fiscal Flycatchers. 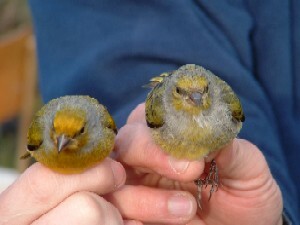 This photo shows the colour differences in the male (left) and female. Photo H.D. 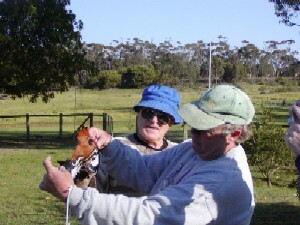 Oschadleus Bob Ellis (behind) and Peter Nupen having a good look at the African Hoopoe's wing barring. Photo H.D. 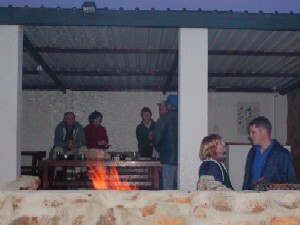 Oschadleus The group enjoying a braai (barbaque) in the evening. We were lucky to have great weather the entire week. Photo H.D. 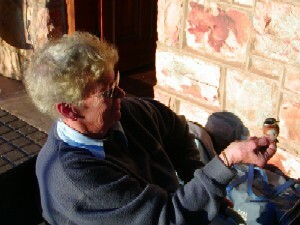 Oschadleus Margaret McCall with a female Cape Batis. We would like to thank the Western Cape Nature Conservation Board for allowing us to ring in the De Hoop Nature Reserve and; the staff of Potberg and De Hoop for their hospitality. Many thanks to all those who participated in the course, and added value to the information and experiences gained. And a special thanks to those who travelled hundreds of kilometers to attend the course. 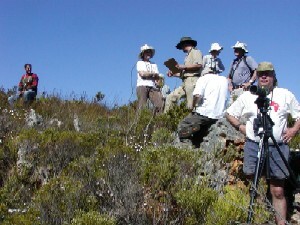 Dieter Oschadleus (SAFRING), Michael Brooks (trainee), Vincent Ward, Marius Wheeler (trainee), Peter D'Arcy (A trainee who qualified as ringer during this course, congratulations), Tygerberg Bird Club members Margaret McCall, Lee Silks, Peter Nupen, Bob Ellis; Dalton Gibbs of Rondevlei Nature Reserve and Pat and Doreen Cochran of Johannesberg.